It’s pretty obvious in terms of making sense but if supported by average numbers the impact is much greater. The above is an article that writes of how much exercise one would need to do in order to lose all the calories they gain on average eating during the Super Bowl game tomorrow. I have never thought of measuring it but here it is according to the article – a person consumes an average of 1200 calories during game time, according to the Calorie Control Council. Get me some more of the wings will yaa!!!? Wait till you read numbers on potato chips, tortilla chips, chicken wings (ridiculous – convert that into how many chickens are used up for that), and beer. It is astonishing. Fine print: I am not against any of this eating. I used to eat the same way and more on this day. I just thought the numbers were really worth sharing J. Enjoy the quick read. And the food tomorrow. Hi all! It’s been a while, isn’t it? Sorry to be away for so long, but I have been trying to manage time better with my daughter’s school and everything else. Hope you have been doing well, and have been missing the recipes a little bit. Lets get straight to the point then. We had bought some celery, dill, mushrooms etc., to make some mushroom barley soup. The mushroom got used up to make something else, so I thought about making a simple but very flavorful dish. I wanted to bring together the individually unique but very complimentary flavors of celery and fresh dill leaves. What better base than yogurt? I kept the preparation very basic, letting the celery and dill make magic together! 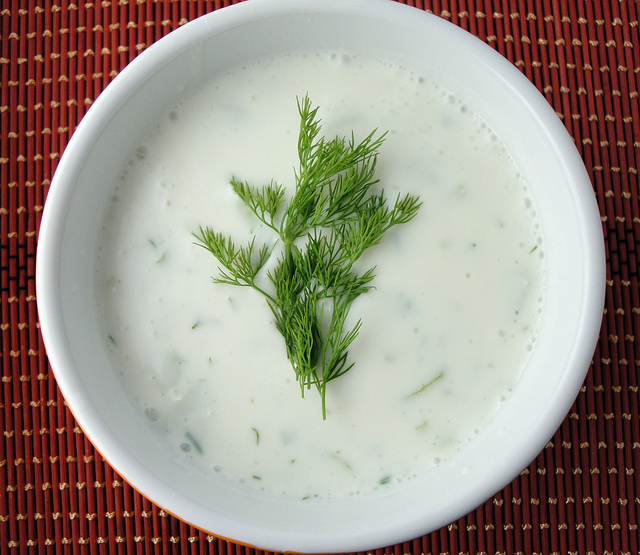 Enjoy this raita as is, or as a compliment with a spicy dish with rice or bread. 1. 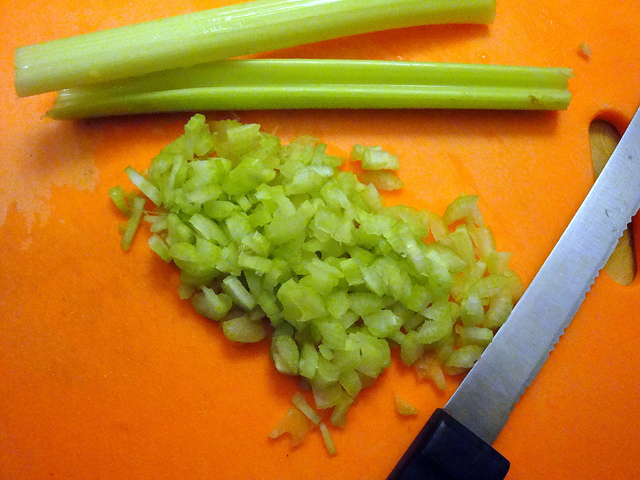 Cut each celery stalk lengthwise equally. 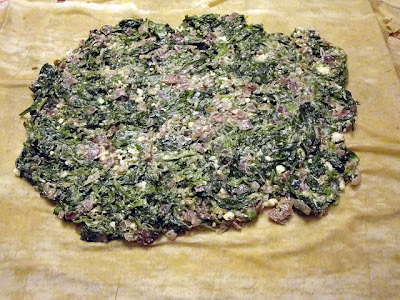 Then chop them into fine thin slices, and set aside in a bowl. 2. Mince the fresh dill leaves (1 tsp packed) and add to the celery. 3. Add yogurt and milk (I like to add a little bit of milk so as to reduce the tangy flavor of the yogurt), and salt, and mix well till everything gets combined. 4. Store for 30 minutes in the refrigerator to let all the flavors combine. We had a block of paneer (cottage cheese sitting in the refrigerator) and I just picked it up for a Sunday quick lunch fix. I also made another favorite of mine, eggplant masala that I shall post shortly. Wife loved it, what else do I need? How can I describe the taste? It is spicy, tangy and crispy, more like an Indian and Asian fusion. Hope you enjoy it. 1) Cut the paneer into 1/2 inch size pieces. Clean the hot chilis and the green pepper and dice them into really small pieces. Set all aside. Please have all the ingredients ready since there are a lot of them, and you don't want to miss any of them. 2) In a small mixing bowl, mix the flours, red chili powder and tandoori masala. 3) In a non stick pan, pour 3 tbsp oil. As it gets hot add the hot chilis and green pepper and cook on medium heat for a few minutes till the water from the pepper evaporates. Add the paneer pieces now and mix well. 4) Roast the paneer for a while till the sides starting getting slightly golden. At this point add the flour/chili/tandoori masala mix and salt (please add salt by taste. Although I have measured the salt, remember Shan tandoori masala has some salt in it as well). Mix everything well, making sure you coat the paneer pieces with the flour and tandoori masala mix. 5) Add 2 tbsp oil. Lower the flame to medium low, moving everything around so as to not burn anything. After the flour has cooked well, and the chilis/pepper and paneer are nice roasted with golden sides, drizzle around the Asian chili sauce, soy sauce and vinegar. 6) Mix everything well for a few minutes till all the water from the sauces just disappears. Turn off the flame and transfer the contents to a serving dish. You are done. 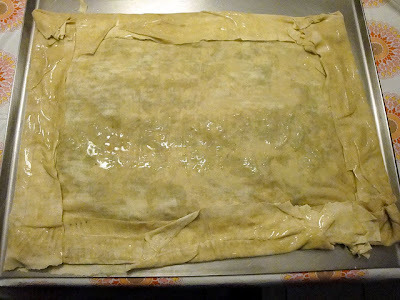 7) Important: Ensure that you stop the cooking process just in time. 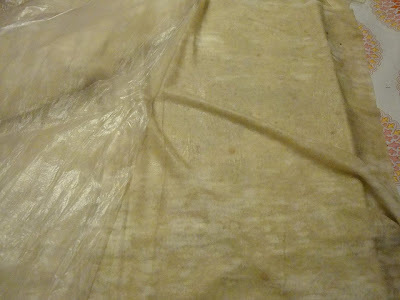 If you cook it till its very dry, then the moisture from the paneer is lost and it doesn't end up tasting good. 8) Serve with single malt whiskey, or with rice and dal and just top it on a fresh green salad. Yum! Phew! its been a while, isn't it? Didn't want to become extinct, no that is not in the plan after doing this for two years. There may be gaps like this, but don't ever plan to shut this down. We had been to a friend’s place for a pool/BBQ party, an annual event which was combined with another friend’s farewell party as he and his family were moving to New Zealand. 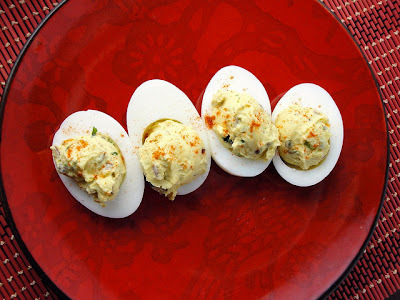 Since it was a BBQ party I decided to load it up and made deviled eggs, something I had never tried preparing before. I think if one puts almost anything along with egg yolks and mayonnaise, in the right proportion that is, it’s going to turn out good. Common ingredients in deviled eggs are mustard, tartar sauce, pickle, olives, etc. But I wanted to refrain from adding anything common, and came up with something of my own. Otherwise there is no fun, right? This turned out great and got eaten up in a few minutes by the gang. Devils!! 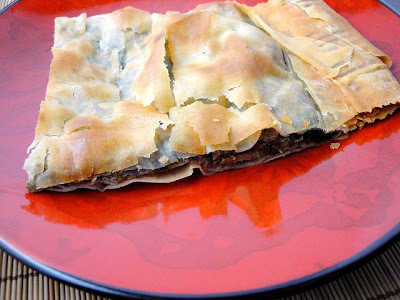 Absolutely tasty, wholesome and filled with lots of different flavors. Here is the recipe. You may notice that I have used yolks from 2 extra eggs and and then some extra mayo. This was done to get the consistency of the filling right. 1) Hard boil 23 eggs. Completely cool down the eggs. Peel the shell off and cut the eggs lengthwise into 2 halves each. 2) Scoop the yolks out from all the halves and set aside in a large bowl. 3) Set 42 egg halves on a large tray. We need only 42 egg halves for this recipe. 4) Mince all the fresh herbs as fine as you can with a knife. This will add to 3 tsp of fresh herbs, packed. 5) Dry roast the cumin seeds in a pan till you smell the aroma, and then grind it coarse. 6) In the large bowl with the egg yolks, first mash the yolks fully. To this add the olive oil, mayonnaise, minced red onions, minced jalapeno, minced fresh herbs, minced capers, ground cumin seeds, and salt to taste. Mix everything really well until it forms a nice smooth texture. 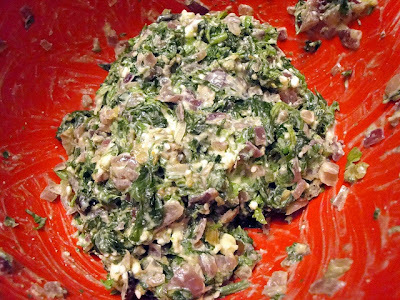 7) With a scoop or a spoon, add this mix into the hollow portion of the egg halves. Garnish on top with cayenne pepper and coriander leaves. 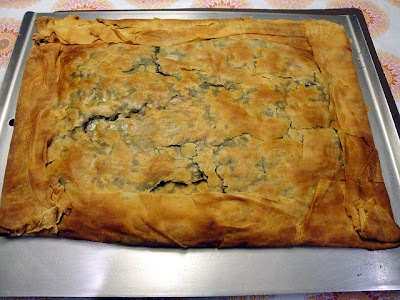 8) Refrigerate it for 30 minutes to an hour before serving. Enjoy!